Once per turn: You can target 1 other card you control; send it to the GY, also your opponent cannot activate cards or effects in response to your Spell Card activations this turn. Once per turn, during the End Phase: You can Set “Sky Striker” Spells with different names from your GY to your field, up to the number of “Brandish” Spell Cards you activated this turn while this card was face-up on the field, but banish them when they leave the field. Sky Striker Mecha Modules – Multirole functions differently than many of the other Sky Striker Spell cards, being a Continuous Spell and not a Normal or Quick-Play. Sending a card to the grave that is yours in this archetype will fill the grave with Spell Cards, but also gets rid of monsters you steal from your opponent with Window Anchor. The added benefit of locking your opponent out from negating your spells this turn ensures you’ll get the most out of them in addition to getting them into the grave. In the End Phase you can cycle back to the field different named archetype spells from the grave equal to the number of archetype-specific spells you played this turn. Essentially that means you will get two uses for the price of one. The only downside is the banish effect once you activate them again. This will drop your total in the grave and lower the power of your Sky Striker Link Monsters, but will help advance your plays to refill your grave and gain advantage, so it is decently balanced. Sky Striker Mecha Modules – Multirole is an excellent Continuous Spell Card. Unlike many other Sky Striker Spell Cards, you can have monsters on your side of the field. You will need one card to target and send to the grave to guarantee your other Spell Cards cannot be responded to. Then, you can also set Sky Striker Spells with different names from the grave to your field up the number of Sky Striker Spells you activated while Multirole was face-up. They get banished if they leave the field so you can’t really use these effects out of order. Also, you don’t need three or more Spells in the grave to gain either effect. This is a very balanced card but does not generate immediate advantage. Own all 3 for sure, but Multirole might only need 2 in the deck because opening hands are important, and this one isn’t as necessary as the others. Next up on our Sky Striker week is a card I’ve seen be compared to with Spellbook of Judgment and that is Sky Striker Mecha Modules – Multirole. Multirole is a Continuous Spell, and a good one at that. Once per turn, you can target another card you control and send it to the GY to prevent your opponent from responding to your Spell Cards for the rest of the turn. The insurance is nice to have, and having this send something like the Field Spell of the deck is great for generating more advantage since the Field Spell will get you the only Sky Striker monster in the Main Deck when it leaves the field to open up your Link Monsters. Once per turn, during the End Phase, you can set Sky Striker Spells with different names back to your side of the field from the GY up to the number of Sky Striker Spells you activated this turn while this was on your side of the field, but those Spells are banished when they leave the field. If you already have a ton of Spells in your GY, then you can use this and still get the effect most Sky Striker Spells have when you have 3+ Spells in the GY, so you banishing them will be fine. Grabbing the Quick-Play Spells they have can be great for some disruption or you can grab back the Monster or Spell/Trap removal they have (while I am on the Quick-Play Spells, I’ll mention that Widow Anchor is a three of in the Sky Striker deck, just correcting myself from yesterday when I said two was fine, the card is worthy to be a three of). If you want to get the searcher back, then you can really generate advantage as it lets you draw a card as well. 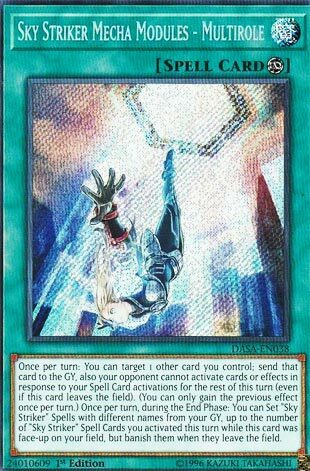 This card is a must for the pure Sky Striker decks as it really helps keeping massive advantage. Art: 4/5 Hope that landing goes smoothly. Where did she come from, though? Next on the list this week is Mecha Modules-Multirole, and this card, I immediately feel you could still almost tech elsewhere, although this is much more obviously used to full potential for Sky Striker. This does have the unfortunateness of being a Continuous Magic Card, but it’s rather excellent for the Deck. This card can protect your Magic cards, at the cost of another, so that’s fun. (That’s the part that makes me feel it could be used in other places and Decks) so anything you play after that can’t be responded to. The cycling of the Magic cards from the Graveyard back immediately to the Field is very awesome, and has a balanced cost of you get what you give…or gave, I suppose, more accurately. They’re removed from play when they leave the Field, but that shouldn’t be an issue. The advantage that can be had here could be tremendous, and it should be. If you’re doing it right.